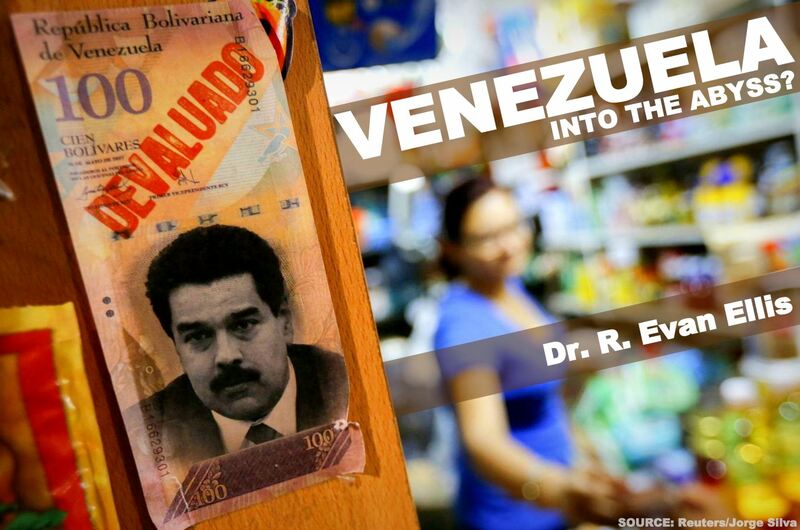 FEATURED | Venezuela: Into the Abyss? Home / Featured / Latin America / Venezuela / FEATURED | Venezuela: Into the Abyss? The magnitude of the victory by the Venezuelan opposition in the December 6, 2015, congressional elections surprised many in the country, and in the region, who had expected that the government of Nicolas Maduro would use its control over much of the media, most of the economy, the electoral authority and the repressive apparatus of the state to reduce the opposition margin of victory, if not engage in large scale electoral fraud to change the results entirely. The enormous opposition victory gave the “Unified Democratic Table” (MUD) coalition 112 of the 167 seats in Venezuela’s national assembly, and with it, a 2/3 “super majority” which, at least according to the constitution, could allow it to pass legislation over President Maduro’s veto, remove judges, and force the removal of ministers. The victory unleashed a wave of euphoria in the region by opponents of Maduro and his populist socialist government, and more broadly, those frustrated with the abysmal and deteriorating conditions in the country, including widespread shortages of food, medicines, and basic goods, rampant crime, government corruption, and narco-trafficking, to name a few. In the context of Latin America more broadly, the opposition victory has been interpreted in the context of the November 22 election of conservative Mauricio Macri to the presidency of Argentina, the announcement by Ecuadorian President Rafael Correa that he will not run for a fourth term, the economic crisis in Brazil with the looming impeachment of its president Dilma Rousseff, and the rapprochement between Cuba and the United States, as a trend away from leftist populism across the region. 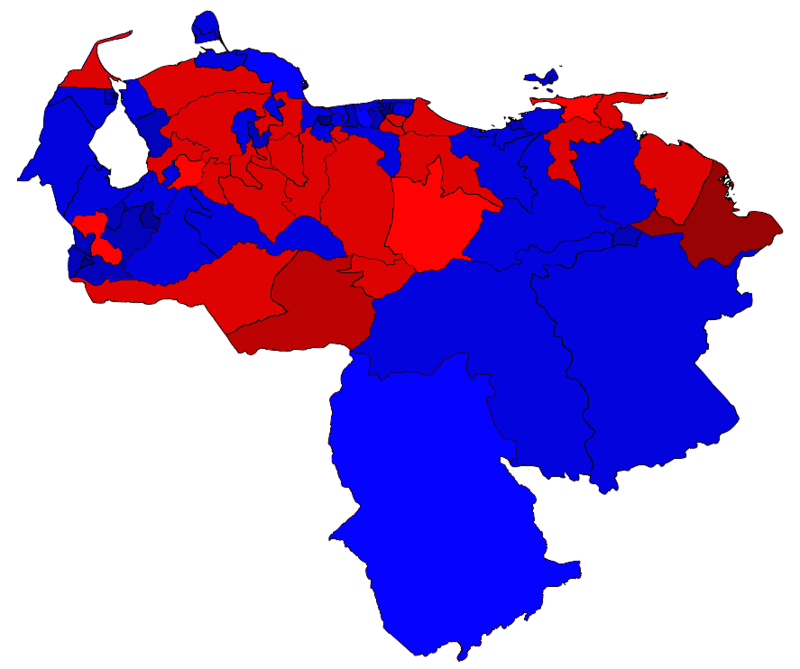 and Red denotes those won by the PSUV. While Venezuela and the region are indeed in the midst of a process of significant transformation, before arriving at the end of the country’s destructive 17-year experiment with populist socialism, it may be on the brink of a chaotic and dangerous phase of political and economic warfare with grave implications for both the country and its neighbors. (3) The structure of the current confrontation, pushing both sides toward a stalemate with escalating tension, augmenting rather than resolving Venezuela’s deepening crises. Maduro and his supporters (hereafter the “Chavistas,” since they are generally united more by Maduro’s predecessor Hugo Chavez, than Maduro himself) possesses a number of powerful weapons to counter the MUD “supermajority” in the just elected national assembly to be seated on January 5, 2016. They have already shown their disposition to use them to work against, rather than with, that elected majority, even if the legality and constitutionality of those tools are dubious. First, the Chavistas continue to dominate Venezuela’s judicial institutions, allowing them to impede attempts by the newly elected national assembly to pass laws that go against the strategic or material interests of the Chavista government. Indeed, Maduro has already obligated 13 Supreme Court justices to retire early, and in a special session on December 23, the outgoing national assembly, dominated by the Chavista “United Socialist Party of Venezuela” (PSUV) appointed their replacements, denying the incoming, MUD-dominated assembly with the opportunity to install judges acceptable to them, when the normal terms of the sitting judges expire. Ensuring that the Venezuelan Supreme Court and its critical 7 person constitutional chamber will continue to be filled by judges beholden to the Chavistas, will allow them to use the court to rule unconstitutional, or otherwise invalidate laws passed by the new National Assembly. While the appointment of the new judges by the Chavista-dominated outgoing National Assembly may be of questionable legality, both the courts who would decide the issue, and the military and law enforcement organizations which would enforce the decisions, are also in the hands of the Chavistas. Indeed, it has been relatively common during the past 17 years of Chavista government for the opposition to complain of the unconstitutionality of a government initiative, only to find such complaints disregarded by the Venezuela’s Supreme Court. While the incoming national assembly, with their two-thirds super majority, could potentially dismiss the newly appointed judges, again, those dismissed would almost certainly contest their removal, and the courts to which it would fall to resolve the dispute, as well as the law enforcement institutions who would be called upon to remove them, are dominated by Chavistas. Second, even without the help of the newly “packed” Venezuelan Supreme Court, President Maduro has the power to block legislation from the incoming National Assembly by vetoing it, as he has already promised to do with respect to a law granting amnesty for political prisoners that the incoming MUD legislators have prioritized to pass upon assuming power on January 5th. While the 112 seats won by the MUD in the new congress theoretically allows them to override such a presidential veto, the incoming MUD assembly members are an ideologically diverse group, with a range of approaches for confronting or working with the government. Although the granting of amnesty for political prisoners is the first priority of the MUD and will probably find them unified, they are less likely to vote as a block on other issues in the months to come. Moreover, it is likely that the government will work to reduce the opposition’s effective ranks, through a combination of intimidation, and cooperation, as they did with the 64 National Assembly seats won by the MUD in September 2010. Beyond his veto, President Maduro has considerable powers through the 29 ministries under the “Executive Power,” as well as Chavista dominance of other organs of the state including the “Citizen” power (the Public Defender’s office, the Attorney General’s Office, and the Public Ministry), among others. Such dominance allows the Chavistas to exercise day-to-day control over the country even without the concurrence of the National Assembly. It is possible that the outgoing Chavista-dominated assembly could confer on Maduro “rule-by decree” authority, as it did in September 2013, and as the outgoing Chavista National Assembly did in November 2010, to prevent the authority of then President Hugo Chavez from being impacted by the incoming National Assembly in which the opposition had won a greater voice. Indeed, even without such special powers, the arbiter of whether Maduro is within the limits of the constitution in exercising his existing legislative authority is the courts, which are in the hands of the Chavistas. In addition to the powers of the government organizations still in Chavista control, while the Venezuelan National Assembly, in principle, will have control over federal spending, the executive has created funds, such as Fonden, which are relatively independent of legislative authority, and allow Maduro to continue select activities even without the assembly authorizing funds for the government, although the amount of money actually in such funds is unclear. At the same time, such “power of the purse,” while an important tool, will also be, in practice, very difficult for the National Assembly to exercise, since de-funding government programs would, in principle, allow the Chavistas to blame the opposition not only for the economic hardship caused by such acts, but for the suffering occasioned by the conditions of the broken Venezuelan economy in general. Finally, the Chavistas have demonstrated an intent to create a National Communal Assembly that parallels the Venezuelan National Assembly. This body would be a congress of the “Communal councils,” created by then president Hugo Chavez and the PSUV-dominated legislature in June 2010 , after the attempt to establish the councils through a popular referendum in 2007 failed. Anticipating the potential utility of the communes as a tool of Chavismo at the grassroots level, President Maduro increased the 2015 budget for the communal councils by 62% over its 2014 level. The creation of a national communal assembly, while lacking constitutional authority to make laws, allows the Chavistas to create the illusion among its followers of support from “a legislature” for its program. Indeed, outgoing head of the national assembly Diosdado Cabello symbolically invited the communal council to sit in the National Assembly building until the incoming Congress takes office on January 5th. The presence of the communal assembly, publicly debating national policy issues in the physical space of the Venezuelan legislature with the blessing of the executive branch, and the need for the incoming legitimately elected national assembly to displace or disband it when it assumes power on January 5, ironically creates the opportunity for Maduro to mobilize followers around accusations that the opposition is going against the “will of the people” by doing so. The outcome of the present struggle between the incoming National Assembly on one side, and Chavistas, who control the courts, ministries and organization of government, cannot be readily predicted through an analysis of the powers of each body under the constitution, since during the past 17 years, the Chavistas have arguably repeatedly shown a willingness to stretch the government’s constitutional authority beyond its limits, or (some might say), simply ignore constitutional limits to their powers. In the upcoming struggle, the Venezuelan constitution is not a framework which establishes the rules of the game and the powers of each side, but rather, a weak tool for legitimization in a political discourse in which multiple actors, including the Venezuelan military, police, and other institutional actors, decide where to place their loyalties. While, as argued in the preceding paragraphs, the Chavistas will have considerable authority to ignore or override the newly elected National Assembly, one of the most likely scenarios will be a dangerous paralysis of government in the context of an escalating national economic and political crisis. In the coming months, it is probable that the opposition-dominated National Assembly will pass important laws that challenge the power of the Chavistas, which President Maduro will subsequently veto, some of which may be overridden by the Assembly, then challenged by the Chavistas in the courts, including the constitutional chamber of the supreme court, which is likely to declare them unconstitutional. Similarly, the Maduro government is likely to continue to launch new initiatives and execute existing programs in perceived contradiction to the constitution or new laws passed by the assembly, leading it to challenge the government in court, to use its power of the purse to defund the government, or both. In the extreme case, such conflict and defunding could precipitate the collapse of the final vestiges of the Venezuelan government and productive sector. If oil production and export by the national oil company PdVSA were affected, such a crisis could simultaneously force Venezuela to default on its debts and lose the last remnants of its ability to import basic goods for the Venezuelan people, a particularly grave occurrence given that Venezuela's own industrial and agricultural capacity have been decimated over 17 years of Bolivarian rule. In addition to the increase in the already enormous suffering of the Venezuelan people, the bitter discourse regarding who was to blame would likely mobilize Venezuelans on all side and produce civil unrest going far beyond that seen in 2014, if not occasioning an outright collapse of public order. Indeed, Venezuelan security experts consulted for this work anticipate that the armed forces might intervene if the conflict between powers extend for several months. Even if the situation does not evolve into civil unrest, the confrontational posture adopted by Maduro will increase the likelihood that the opposition supports the collection of signatures to hold a referendum to recall President Maduro, when its constitutionally defined window to do so presents itself in mid-2016. The Chavista-dominated Supreme Court or the National Electoral Council (CNE) will likely rule to block any such effort, and the fight to take the recall referendum forward is one of the focal points around which violent struggle could emerge. The choice of who is elected as head of the National Assembly when the new body convenes on January 5 could be critical. Some of the candidates mentioned to date include Henry Ramos Allup and Julio Borges. Borges’ party, Primer Justicia, arguably represents the new generation of politics within the Venezuelan opposition. Neither candidate, however, fully represents the MUD, which features a diverse array of groups, agendas, and political orientations. Ramos’ party, Acción Democrática, is one of Venezuela’s two establishment parties of the pre-Chavez era, would arguably present an attractive target for Chavista efforts to characterize the National Assembly as dominated by the interests of Venezuela’s pre-Chavez political establishment and business elites, although some consulted for this analysis, who know Ramos, suggest that his experience could be useful in managing the dangerous political showdown likely to come. Yet others consulted for this analysis suggest that the bargaining approach embodied by Ramos could turn out very badly. Beyond the choice of who will preside over the incoming National Assembly, it is also not clear to what degree the Chavistas will succeed in dividing or coopting members of the MUD coalition. Indeed, if the opposition is able to overcome the previously analyzed impediments to governing and rally the Venezuelan people around concrete results, it could actually attract some defectors from the PSUV. A number of PSUV delegates are said to be upset by the widespread corruption and poor governance in Venezuela, while others would presumably be attracted by the power and access to resources potentially available by being part of the majority in the assembly. Another key question is who the Venezuelan public will blame if conditions in the country continue to deteriorate in the context of political conflict between the Chavistas and the MUD. If the people believe that the newly elected members of the National Assembly are making conditions in the country worse, rather than better, they could turn against them. Yet if, on balance, they perceive that an intransigent President Maduro is thwarting their will to change, expressed in the December 6 election, the wrath of the people may turn on the Chavistas in general. Beyond the perception of the people regarding “who is to blame,” the posture of the Venezuelan military will be more important than ever in the outcome of the conflict. During the election, Minister of Defense Vladimir Padrino Lopez reportedly made it clear to President Maduro that the military would not condone large scale electoral fraud, nor take to the streets to repress Venezuelans, if the perception of government vote fraud produced civic unrest. Indeed, the military is believed to have taken a similar position in December 2007 when Hugo Chavez lost a key national referendum, forcing him to accept the results. In the coming months, the military may be called upon to again make such a decision if a major constitutional dispute forces it to choose between following the orders of Maduro, or the laws passed by the Congress. The continuing stream of criminal indictments by U.S. and other courts against Venezuelan officials, including the indictment of the head of Venezuela’s National Guard, Nestor Reverol, and charges against the nephews of Venezuelan First Lady Cecilia Flores, is also likely to play an important, albeit indirect, role in the outcome of the Venezuelan crisis. As the military, and other agents of the Venezuelan government face decisions regarding following the orders of Maduro or the laws passed by the National Assembly, they may also be influenced by such indictments. While the Maduro government almost certainly will not extradite those indicted by the U.S., such cases will sew uncertainty among those who are involved in narco-trafficking within the military and Venezuelan government, regarding whether they can risk traveling abroad in light of possible sealed indictments against them. Moreover, as an increasing number of persons are captured and chose to cooperate with international authorities, and as an increasing number of officials have their assets outside Venezuela frozen due to accusations of wrongdoing, those who remain will increasingly fear losing their ill-gotten gains, or going to jail when the government eventually changes, if they do not act while they can to “cut a deal.” In addition, those indicted, if not removed from office will further undermine the credibility of the government, fuel more fractures within the ruling party and nomenclature and increase tensions within the Armed Forces. In short, the unfolding of such criminal cases, in combination with mounting evidence that the Chavista regime is on its last legs, may change the calculus of the military. Instead of conspiring to help the President Maduro and his allies hold on to power, they may seek ways to cooperate with the opposition and international law enforcement to escape future criminal charges, as well as to protect the integrity of the Venezuelan military as an institution. How the broader international community reacts to the unfolding drama will also impact the outcome. With the loss of power of the Peronists in Argentina’s November 22, 2015 elections, the unfolding political crisis in Brazil, and Cuba’s rapprochement with the United States, Venezuela no longer has dependable allies to shield it from international scrutiny and pressure the way it once did. Indeed, with Venezuela’s diminished ability to provide subsidized petroleum to PetroCaribe, even its leverage over nations in the Caribbean in the past year has arguably weakened. The People’s Republic of China (PRC) may also play a key role in the transition. The PRC has already loaned Venezuela more than $56 billion since 2005, and has funds that could help the Venezuelan government overcome the present crisis. Yet it also has demonstrated caution in providing new funds to Venezuela when political leadership in the country is uncertain, as occurred during the 2012-2013 transition from Hugo Chavez to Nicolas Maduro. Western companies and institutions such as the International Monetary Fund may similarly play a role in re-negotiating loans and providing new capital and investment for Venezuela, but it is doubtful that they will do so with Venezuela in the midst of a political crisis, while the efforts by the Chavistas to circumvent the outcome of the December elections casting doubts on the government’s commitment to rule of law in general, let alone honor its financial commitments. In the December 6th election, the Venezuelan people expressed a strong desire to turn away from the policies of Chavismo and more pointedly the Maduro government as the path to growth, development and greater fairness and justice. There is arguably, however, no consensus within the opposition nor the government about the path forward, yet there are reasons to be concerned regarding how the new political dynamic set into motion by the December 6th election will turn out. The United States has a strong interest in helping Venezuela to avoid that Venezuela’s political struggle degenerates into economic collapse, disorder and violence harming not only Venezuelans, but potentially generating adverse impacts on the nation’s neighbors in South America and the Caribbean basin. At the very least, the United States can help Venezuela’s neighbors to prepare for the possible consequences of such a disaster. At best, it can work through multilateral institutions, bilateral diplomacy, and conditional economic assistance, to ensure that the bold choice of the Venezuelan people on December 6 succeeds in re-establishing a framework of democracy, rule of law, and healthy independent governing institutions in the country. One of the most powerful tools that the United States has for bringing about change in Venezuela, ironically, is its continued pursuit of those in Venezuela’s leadership who have engaged in narco-trafficking and other illegal behavior, making them subject to prosecution in the U.S. under the provisions of international law. As the incoming Venezuelan Congress struggles to fight corruption and restore democratic accountability to its institutions, U.S. authorities should reach out to it, to pass new laws in Venezuela, or strengthen existing ones, that strengthen its hand in doing so. These potentially include laws in areas such as extradition, law enforcement cooperation, and the sharing of financial data. Presuming a positive outcome of the struggle, the U.S. should also be prepared to provide assistance, through appropriate State and Justice Department channels, to help the government to strengthen the capacity of judicial institutions, re-take control of Venezuela’s prison system, and to purge corruption in the police through a combination of confidence tests and changes to the nation’s “basic law” as necessary. The United States should also engage in a dialogue with the Venezuelan military, to include indirect interactions through the militaries of other nations which engage regularly with the Venezuelans, regarding the importance, as the situation deteriorates, of not engaging in activities that will bring about bloodshed, undermine the prestige of the military as key defender of the constitutional order, and lead to actions for which individual members may be held criminally liable in the future. The United States can also assist by coordinating with Venezuela’s neighbors Guyana, Colombia, and Brazil, to augment their security in the event that the destabilization of the country gives rise to rash action by its leadership such as military action against the Essequibo region of Guyana, or la Guajira region of Colombia, bordering Venezuela. The United States should also be prepared to support Venezuela’s neighbors if such a collapse occasions a cross-border flood of refugees, or a significant spike in narco-trafficking and criminal activity along Venezuela’s borders. Beyond such preparations, the United States should also work through the Organization of American States (OAS) to hold Venezuela accountable for adhering to the democratic framework of its own constitution, including the invocation the OAS Democratic Charter if necessary, suspending Venezuela from the organization and sanctioning it, if it fails to do so. At the same time, the United States should also be prepared to commit resources through the same Inter-American system to support Venezuela’s resolution of institutional disputes and weathering of the economic crisis, possibly including emergency loans through the Inter-American Development Bank once the resolution of political disputes in the country, and the demonstration of political will by the Venezuelan executive, permit such aid. Indeed, the present crisis represents an opportunity for the United States to help restore the OAS to its rightful place as the lead multilateral institution for the countries of the Americas to collectively address their security and other challenges. OAS Secretary General Luis Almagro has already demonstrated the potential for the OAS to play such a role, through the leadership that he has already shown in publicly fighting for adherence to democratic processes in Venezuela. Nonetheless, assistance through the OAS or other organizations whether by the OAS will also require a commitment of the executive to work with the opposition to govern and resolve Venezuela’s crisis together, a commitment to adhere to the nation’s own constitution, and the release of the estimated 80 political prisoners in the country, such as Leopoldo Lopez, former Caracas mayor Antonio Ledezma, and former mayor of San Cristobal Daniel Ceballos. As one element of Venezuela’s economic stabilization, the United States can also play a role in supporting Venezuela’s efforts to salvage its national petroleum company, PdVSA, and restructure its oil sector. Restoring PdVSA to a reasonable level of functionality will be necessary to produce the revenues that the country needs in the short term to import the basic needs of its people. To date, the Maduro regime has shown no intention to work with the newly elected National Assembly on this issue. Thus helping Venezuela to rescue its economy, and its society, may have to wait until the Maduro administration is either driven from office, or forced to compromise. The U.S. should also coordinate with other key players such as the PRC regarding assistance to Venezuela. The U.S. can make making it clear to the PRC that it will not object to it providing loans to, and investment in, Venezuela to help the country weather the crisis and rebuild its economy, but that such engagement must take place under conditions of transparency, and respect for the nation’s laws and constitution. The U.S. should emphasize that it will not tolerate Chinese banks providing funds to the Venezuelan Executive through extra-constitutional channels, or otherwise interfering in the internal affairs of the country by helping the Chavistas prevail in their institutional struggle against the opposition. For China, such coordination with the U.S. over assistance to Venezuela arguably presents its government and country with a “win win” situation, insofar as that it would help the PRC to secure its at-risk investments and pursue its economic interests in a more economically functional country, in an atmosphere of predictability, while at the same time, helping it to establish a more constructive relationship with the United States in the region. Through the opposition victory in the December 6 Venezuelan elections, it is possible to foresee an eventual end to 17 years of populist socialism which has destroyed the Venezuelan economy and governing institutions and polarized its people. Yet in approaching that end, Venezuela is arguably passing through one of the most dangerous periods in its contemporary history. The actions taken by all parties in Venezuela, by the United States, and by the rest of the international community, will have an enduring effect far beyond Venezuela’s borders. Dr. R. Evan Ellis is an analyst of Latin American economic, political, and security issues, with a research focus on Latin America’s relationships with China and other external actors, including India, Russia, and Iran. He is an associate professor of Latin American studies at the U.S. Army War College Strategic Studies Institute (SSI), and he has previously served as a professor with the William J. Perry Center for Hemispheric Defense Studies in Washington, D.C. Dr. Ellis has authored over 120 works, including China in Latin America: The Whats and Wherefores (Lynne Rienner, 2009), The Strategic Dimension of Chinese Engagement with Latin America (Perry Center for Hemispheric Defense Studies, 2013), and articles in national security, finance, and technical journals. He has presented his work in a broad range of business and government forums in 25 countries on 4 continents. He has discussed his work regarding China and other external actors in Latin America on a number of radio and television programs, including CNN International, CNN En Español, Voice of America, and Radio Marti, and has testified on Chinese activities in Latin America before the U.S. Congress. He is also cited regularly in the print media in both the United States and Latin America, including in the Washington Times, Bloomberg, America Economia, DEF, and InfoBAE. Dr. Ellis holds a Ph.D. in political science with a specialization in comparative politics from Purdue University. The author is professor of Latin American Studies with the U.S. Army War College Strategic Studies Institute. The views expressed here are strictly his own. William Neumann, “Venezuelan Opposition Claims a Rare Victory: A Legislative Majority,” New York Times, December 6, 2015, http://www.nytimes.com/2015/12/07/world/americas/venezuela-elections.html?_r=0. See, for example, Andres Oppenheimer, “Andres Oppenheimer: Obama's big opportunity in Latin America,” Miami Herald, December 12, 2015, http://www.miamiherald.com/news/local/community/broward/article49303765.html. Diego Ore, “Venezuela's outgoing Congress names 13 Supreme Court justices,” Reuters, http://www.reuters.com/article/us-venezuela-politics-idUSKBN0U626820151223. Kejal Vyas, “In Venezuela, Lame-Duck Parliament Plans to Pack Supreme Court,” The Wall Street Journal, December 15, 2015, http://www.wsj.com/articles/in-venezuela-lame-duck-parliament-plans-to-pack-supreme-court-1450233104. Andrew Cawthorne, “Triumphant Venezuela opposition looks to boost economy, free prisoners,” Reuters, December 7, 2015, http://www.reuters.com/article/us-venezuela-election-idUSKBN0TP03Y20151208. Emilia Diaz-Struck and John Forero, “Venezuelan president Maduro given power to rule by decree,” Washington Post, November 19, 2013, https://www.washingtonpost.com/world/the_americas/venezuelan-president-maduro-given-power-to-rule-by-decree/2013/11/19/af304c3c-516b-11e3-9ee6-2580086d8254_story.html. Philip Sherwell, “Chavez given power to rule by decree for 18 months,” Daily Telegraph, December 18, 2010, http://www.telegraph.co.uk/news/worldnews/southamerica/venezuela/8211537/Chavez-given-power-to-rule-by-decree-for-18-months.html. See, for example, “Central Bank of Venezuela to transfer USD 3.7 billion to Fonden,” El Universal, January 14, 2014, http://www.eluniversal.com/economia/140114/central-bank-of-venezuela-to-transfer-usd-37-billion-to-fonden. “¿Qué es el Parlamento Comunal que instaló el chavismo luego de perder la mayoría legislativa?,” El Nacional, December 16, 2015, http://www.el-nacional.com/bbc_mundo/Parlamento-Comunal-instalo-chavismo-legislativa_0_757724376.html. Jaime Lopez, “Venezuela aprueba la primera ley sobre comunas y busca legalizar el trueque,” El Mundo, June 23, 2010, http://www.elmundo.es/america/2010/06/23/venezuela/1277310400.html. Nick Miroff, “On Venezuela’s communes, idyllic future is just over the rainbow,” Washington Post, November 25, 2014, https://www.washingtonpost.com/world/on-venezuelas-communes-idyllic-future-is-just-over-the-rainbow/2014/11/25/838f3bf4-6602-11e4-ab86-46000e1d0035_story.html. “Cabello instala un Parlamento Comunal dentro de la Asamblea Nacional,” Diario de las Americas, December 15, 2015, http://www.diariolasamericas.com/4848_venezuela/3516371_cabello-instala-un-parlamento-comunal-dentro-de-la-asamblea-nacional.html. See, for example, William Partlett, “Hugo Chavez’s Constitutional Legacy,” Brookings, March 14, 2013, http://www.brookings.edu/research/opinions/2013/03/14-chavez-constutional-legacy. Juan Francisco Alonso, “Jueza condena a Leopoldo López a casi 14 años de cárcel por hechos del 12F,” El Universal, September 10, 2015, http://www.eluniversal.com/nacional-y-politica/150910/jueza-condena-a-leopoldo-lopez-a-casi-14-anos-de-carcel-por-hechos-del. See Carlos Garcia Rawlins, “Venezuela’s Military Saved Democracy (For Its Own Reasons),” Reuters, December 17, 2015, http://www.thedailybeast.com/articles/2015/12/17/how-venezuela-s-military-saved-democracy-for-its-own-reasons.html. Julia Harte and Nate Raymond, “U.S. to charge Venezuela's National Guard chief with drug trafficking,” Reuters, December 15, 2015, http://www.reuters.com/article/us-venezuela-usa-idUSKBN0TY2RV20151216. See, for example, R. Evan Ellis, “Chinese Engagement with the ALBA Countries: A Relationship of Mutual Convenience?” in Decline of the U.S. Hegemony? : A Challenge of ALBA and a New Latin American Integration of the Twenty-First Century. Bruce M. Bagley and Magdalena Defort, eds. Lanham, MD: Lexington Books, 2015, pp. 345-368. A similar recommendation was made in March 2015 by Ambassador Patrick Duddy, “Political Crisis in Venezuela,” Council on Foreign Relations, March 2015, http://www.cfr.org/venezuela/political-crisis-venezuela/p36356. See, for example, “US ready to invoke Inter-American Charter in Venezuela if necessary,” El Universal, March 12, 2014, http://www.eluniversal.com/nacional-y-politica/140312/us-ready-to-invoke-inter-american-charter-in-venezuela-if-necessary. “OAS chief slams Venezuela over election observation,” Reuters, November 10, 2015, http://www.reuters.com/article/us-venezuela-election-idUSKCN0SZ33U20151110. “Winning Big, Venezuela's Opposition Now Plans Push For Prisoner Release,” National Public Radio, December 12, 2015, http://www.npr.org/sections/parallels/2015/12/12/459054144/winning-big-venezuelas-opposition-now-plans-push-for-prisoner-release.